A little over a year ago I wrote about Hugo Chavez's grasping quest for power in Venezuela and I thought it would be helpful to recap some of his "accomplishments" in the past twelve months. I refer to him as a communist because, according to the Economist, he refers to himself as one. As for him being a dictator, well, dictator is as does. The mindset is there. Considering the policies he is pursuing, it looks clear to me that there are strong similarities in the actions of Chavez and Mugabe and Castro. The primary difference is that Venezuela is fortunate enough to be sitting on huge oil reserves, thus softening the damaging impacts felt from his bad decisions. Mugabe and Castro don't have that geological luxury, and their tenures have been much longer, so there's been more time to see how their decisions have unfolded. But before opining further, some examples of Chavez's moves. More power over food prices and distribution. Shortages have sporadically appeared with items from milk to coffee since early 2003, when Chavez began regulating prices for 400 basic products as a way to counter inflation and protect the poor. Yet inflation has soared to an accumulated 78 percent in the last four years in an economy awash in petrodollars, and food prices have increased particularly swiftly, creating a widening discrepancy between official prices and the true cost of getting goods to market in Venezuela. The government's response to the problem has been--rather than economic liberalization--harsher law enforcement and threats to expropriate inventories and nationalize supermarkets. The president says he will nationalise any privately-owned supermarkets and food storage facilities caught hoarding supplies or violating price controls imposed on basic goods. "If they remain committed to violating the interests of the people, the constitution, the laws, I’m going to take the food storage units, corner stores, supermarkets and nationalise them," Chavez said. Pass the chicken feet, por favor. 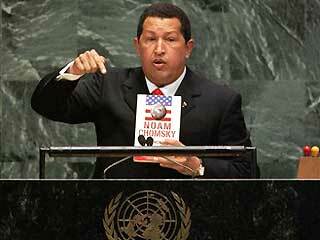 The Caracas Chronicles offer Chavez a helpful primer. The main point here is that Chavez's decisions consistently move in one direction, toward greater government ownership and control. More power over telecommunications and electricity. He said that he planned to nationalise the telecommunications and electricity industries. He rang a television show to say that he was replacing the vice-president, José Vicente Rangel, who was one of the few remaining figures in the government with his own political clout. Shortly after winning a presidential election in December with 63% of the vote, Mr Chávez announced that he would not renew the licence of one of the country's oldest broadcasters, Radio Caracas Televisión (RCTV), when this expires on May 27th. The owner of RCTV, Marcel Granier, is an outspoken critic of Mr Chávez. The decision appeared to be "a form of censorship [and] a warning to others", in the view of José Miguel Insulza, a Chilean Socialist who is secretary-general of the Organisation of American States. The opposition press faces increasing harassment. But government-owned media are multiplying. The government accuses RCTV of breaking broadcasting laws, of discriminating against Mr Chávez's supporters and even of conspiring against the state. Yet it has made no effort to air its case in the courts. The broadcasting regulator, Conatel, has remained silent on the issue. Its director, Alvin Lezama, was sacked not long after the RCTV decision was announced, and the body merged into a new telecommunications ministry. Reporters Without Borders is worried, and the Devil's Excrement blog has several examples of how Chavez is clamping down on speech. More power over oil and natural gas industries. Also deemed "strategic" were refineries which upgrade the heavy oil from the Orinoco belt, operated by multinationals including BP, Exxon Mobil and Total. Hitherto, the government had merely said that the companies should cede a 51% stake in the oilfields themselves, not the refineries. In his inaugural speech, Mr Chávez said he wanted to change the constitution to give the state control over natural-gas operations as well. Today, Chavez acted on his promise, decreeing that he will take over oil projects runs by foreign companies, calling the private control "disgraceful". Chavez is getting today his official "enabling law", which has even been enlarged in scope from the preliminary proposal. As of today no man in Venezuelan history will have had as much power, as much discretionary power that is, with the possible exception of Juan Vicente Gomez. now Chavez, for 18 months, will be able to emit decrees that will be laws and can only be overturned by a congressional vote, Something totally unrealistic since the National Assembly has been unbelievably bending over to court him. Then again they were all but appointed by him. A committee of his supporters is drafting a constitutional reform to turn Venezuela into an avowedly socialist country, and to allow the president to stand for re-election indefinitely. Checks and balances are gone. The National Assembly is a rubber-stamp legislative body on an 18-month vacation, and Chavez's cronies dominate the courts. A state governor allied with President Hugo Chavez ordered the expropriation of a private airport on the outskirts of Caracas, the airport's manager said Thursday. The small Caracas Airport in Charallave is being seized under the orders of Miranda state Gov. Diosdado Cabello, airport manager Henry Vasquez said. The move to expropriate the airport, primarily used by smaller planes, coincides with Chavez's drive to nationalize businesses in "strategic sectors" as he aims to establish a socialist economic system. Caracas' main airport, Simon Bolivar International Airport on the coast in Maiquetia, is already state-owned. The main airport in Caracas is already nationalized. While Chavez is controlling more ports of entry, Venezuelans are seeking asylum in record numbers. According to Investors Business Daily, Venezuelan immigration to the U.S. has increased over 5,000 percent since 2000. More power over a larger military, and more military power exercised against his people. Officials at first said that the men had died in a "clash" between armed miners and the troops. But Manuel Felipe Lizardo, who survived after being shot twice and left for dead, told a different story. He says the troops split the miners into two groups, forced them to lie down and then murdered them. The brother of one of the victims said the dead men were not mining but packing up their equipment. The soldiers had arrived in one of the Venezuelan army's brand-new Russian helicopters, bought earlier this year by Mr Chávez. Fourteen officers and men have been arrested in connection with the case. The government insists their superior officers were not involved, and that the anti-mining operation will continue. The massacre was not an isolated incident. Another 18 soldiers are accused of "abuse of authority" in connection with an almost simultaneous case on the upper Caura river. Four men drowned there, allegedly when fleeing an army operation. Some survivors say they were deliberately burned and that the soldiers stole gold and diamonds. More recently, a Guyanese miner was shot dead on the border between the two countries. In La Paragua itself two men were killed by the army in March. Rafael Madero, a local miners' leader, says the solution is to allow small-scale miners to stake legal claims. Geraldine Malasano, a lawyer and environmentalist who has lobbied for the miners but supports Mr Chávez's government, echoes official disdain for individual property rights. But if the government is to bring the goldrush under control, she says, it must take the miners' views into account. Chavez is intent on growing his military power. Right now, he is the largest arms buyer in Latin America. Venezuela's arms spending has climbed to more than $4 billion through the past two years, transforming the nation into Latin America's largest weapons buyer and placing it ahead of other major purchasers in international arms markets like Pakistan and Iran. Venezuelan military and government officials here say the arms acquisitions, which include dozens of fighter jets and attack helicopters and 100,000 Kalashnikov assault rifles, are needed to circumvent a ban by the United States on sales of American weapons to the country. Right. Because if Chavez can't buy weapons from the United States, he therefore must go on a $4 billion spending spree. There's no other choice. Bush made him do it. It's all Bush's fault. The International Crisis Group has a summary of the Venezuelan situation here. It appears that while Chavez complains loudly about the breadth of U.S. power, and is inspired at least in part by the writings of Noam Chomsky, Chavez has no problem amassing political power for himself. No matter that Venezuelan freedoms are in decline, Chavez's is good power and U.S. power is bad. Alek Boyd has written many a well-researched piece on Chavez and what his regime has been doing, and he is one of my top sources for information. Last December, he wrote somewhat surprisingly that there was no crisis anymore. However, that sentiment lasted less than a month. What was a slow-motion communist revolution has speeded up of late, which is too bad for the Venezuelan people. I don't expect U.S. relations with Chavez to get any better, which is unfortunate for us because 10% to 12% of our oil is purchased from Chavez. By enriching him, we are helping him strengthen his hold on power, which is doubly unfortunate. As for what the U.S. can do, not much. We can't immediately stop buying oil from the regime, so our best alternatives are to spotlight his anti-liberal actions, strengthen diplomatic and economic ties with his neighbors, and act like grown-ups when he goes off on one of his tirades. The rest is up to the opposition movement, such as it is. "As for what the U.S. can do, not much." When 63% of the population elects a dictator I’m tempted to just say, “Well, they get what they deserve”. Unfortunately I realize that the implications spread far beyond the local populace. while not defending Chavez, i don't think it's rational for any American to hold "More power over a larger military" against anyone else, especially after the Bush Administration's Unitary Executive claims. OCS, I wonder how many are now regretting their vote. Sometimes what you think you see is not what you are getting. That's happened in other countries. Of course, maybe none of them are regretting it. Huh? Why isn't it rational to hold Chavez's attempt to gain "more power over a larger military" against him? Is it irrational for the US (and its citizens) to oppose larger military forces at the disposal of an anti-US communist dictator who appears intent on expanding his power at all costs, using Castro's disastrous regime as the boilerplate? What to do with Chavez is another matter, but one should keep in mind that his nationalization of industry -- and not anything the US has done so far -- is going to be responsible for the inevitable plunge in foreign investment. It will not be US sanctions that ruin his country, but his own greed and criminality. Even as we keep our cool during his bizarre rants, we should not be so diplomatic as to forget that the guy's a scumbag -- and not even our scumbag. I don't begrudge Chavez growing his military per se, just his phony rationales for doing so (to defend from an American invasion). More disturbing is the way he's growing his citizen militias, which I think numbers around a million. From the handful of interviews I've heard on NPR and other sources, the general populace is very supportive of Hugo (as they call him. Just like Uncle Joe! ), particularly the poor. Essentially, the dynamic is Chavez making common cause with the poor against the nasty industrialists, then the nasty merchants, and eventually the nasty elite, and then the nasty educated, etc. A familiar script. "just his phony rationales for doing so (to defend from an American invasion)"
Why is that phony? Don't get me wrong. . I have 0 enthusiasm for Chavez' burgeoning and familiar totalitarianism. But a potential American invasion is hardly a paranoid fantasy. The US has a stellar history of military intervention (and incredibly amoral CIA work) in South America when the leadership was unsatisfying to us, and Chavez knows he's deeply unsatisfying to us. Meanwhile, you have very influential clowns like Robertson publicly calling for his assassination. And then there's that recent 'preventive' war and that percolating one with Iran. You don't have to agree with Chavez to realize that his concerns about US military intervention are entirely rational. "The primary difference is that Venezuela is fortunate enough to be sitting on huge oil reserves,"
I think you fail to understand the nature of the "extractive resource curse"; Those huge oil reserves are the reason Venezuela's prospects are dim: They give the government too much economic clout for the private sector to compete. According to this analysis of recent Venezuelan military purchases (warning: by The War Nerd), the hardware ordered wouldn't be particularly helpful in the event of an American invasion. Fighter jets, not RPGs, etc. The War Nerd reads that as Chavez's being more afraid of domestic rivals than the US. I hope that's the correct explanation. Another reason for a military buildup would be regional hegemony aspirations. I don't really know much about that. Why isn't it rational to hold Chavez's attempt to gain "more power over a larger military" against him? do you hold America's ever-growing, wildly-over-sized, insatiable, unshrinkable, often-used-badly, $500,000,000,000/yr, ever-more-controlled-by-one-man military against any American president ? Unless Chavez decides to host al Qaeda training camps or the like, I can't see the U.S. getting involved militarily. There're much bigger fish to fry than this loudmouth bass. What this post fails to address, it seems to me, is the extent to which Chavez's totalitarian tendencies manifested themselves prior to his most recent election. If people voted for him knowing full well what they were getting, it strikes me that their choice is none of my concern. Also, this post seems to take the legitimacy of Chavez's election as a given, even though it's a common argument on the Right that the whole thing was a sham, if you believe it then you probably believe Saddam really got 100% of the vote, etc. I'm not sure if the failure to address this point was intentional. While I dislike Chavez's policies, I suspect that we've legitimized his position and pushed him further towards authoritarianism with our heavy-handed approach. (Example: CB fails to quote the part of the Economist article that discusses how the major broadcast networks supported a coup against a democratically-elected leader). By our endorsement of the coup (and possible support beforehand) we've contributed to the radicalization of the situation in Venezuela. This works to no one's advantage (except for those who would like to have Chavez act the blackguard in order to attack his redistributionist policies). As for defending himself against the US: Id hesitate to predict what might happen over a (pulled from rear) 10-year timescale. Certainly in 1985 I wouldn't have predicted a US-led war against Iraq within 5 years. And you can't exactly get this stuff at the last minute (infrastructure, training, etc). I've wanted to give Chavez the benefit of the doubt for as long as he's been in office, since the upper class and the Bush administration seem to hate him quite a lot. But individual rights and democracy matter too, as this informative post reminds us. I hope the American left refrains from supporting Chavez (for whatever our support's worth) unless he does something to earn our trust. However, I view the stuff about Chavez being empowered to rule by decree as a lot more worrying than the military spending. He's got plenty of reason to worry about an American invasion in the next decade or so, as sidereal and Carleton noted. An alternate version of Chavez who was totally committed to democracy might nonetheless decide he needed a bigger military. like Tom above, i wanted to give Chavez the benefit of the doubt. but this post shines light on things that make it pretty hard to continue to do that. he's no champion of democracy and Rule Of Law (where he isn't the law), that's for sure. so, thanks for posting this, CB. enlightenment is good. I'm not sure if the failure to address this point was intentional. It was intentional, Steve. I purposely did not raise the issue of legitimacy. Alek Boyd links to an analysis which puts into the question the 2004 recall election. I haven't read it, but the given that the NCE is fully controlled by hand-picked Chavistas, it is possible that election results from 2004 onward are tainted, but an organization more competent and thorough than Jimmy Carter's would be needed if we are to know for sure, assuming that Chavez provides sufficient transparency in the first place. I suspect that we've legitimized his position and pushed him further towards authoritarianism with our heavy-handed approach. How was our approach heavy-handed, Carlton? There is no evidence that the administration had any involvement in the weekend coup, and we didn't endorse it (you can read the blow-by-blow account here). Our rhetoric has paled before Chavez's. I kinda think Bush and Chavez are mirror images of each other, with the only reversal being on the crony capitalist-vs-crony socialist axis. Just a small point, if you have really long titles, while it doesn't limit the number of recent comments that appear, it does push them down the page a bit. I appreciate you trying to protect yourself from criticism, but something like 'The future with Chavez' or 'Some thoughts on Chavez' with caveats like 'Democratically elected dictator' could easily be put in the first paragraph. Better a tyrant elected by the people of Venezuela that one elected by the board of Exxon. I won't defend Chavez's actions, but I don't feel inclined to take a lordly tone towards those Venezuelans who support him. The poor evidently support him because those educated Venezuelan elites had done a lousy job running the country. It's tragic that their hero is a power-hungry egomaniac, but it wouldn't be the first time that the rich and powerful have helped create their own worst enemy. As for the coup endorsements, the NYT endorsed it before it quickly collapsed and they suddenly remembered they were supposed to be in favor of democracy. The military spending is indefensible. Criticism from Americans on this subject is laughable, but there are no doubt many others who have more credibility than we do to say something about this. Chavez has certainly removed the tattered mask, and revealed the populist patron-style dictator beneath that South America cyclically spawns. I don't agree that the US has done much to foment this, even in our passive reaction to the coup. He clearly stakes his power on publicly confronting, tweeking and provoking the US, and on pouring largess on the poor and likeminded regimes. We have done well to low-key it and not react. His high spending, though, depends utterly on the price of crude. Our engaging the Saudis in keeping the price lower is pressure enough on the likes of Chavez and Iran. In desperation, Chavez (and Iran) move to decouple oil from the dollar in retaliation. That in my mind would ultimately be doing us a great favor. Yep, exactly, Jon. Because before Bush was elected he launched a failed military coup d'etat against the United States. Then when he was elected, he changed the Constitution to combine the House and the Senate into a unicameral legislature, and that same constitutional change also got rid of congressional oversight of military affairs, then Bush expanded the Supreme Court by 60% and appointed cronies to the newly created positions, then he threatened to take over a province in Mexico (just like Chavez is doing with Guyana), then Bush expropriated land without just compensation, then Bush changed the Constitution to curtail press and speech freedoms, and who can forget when Bush sent Congress home for 18 months so that he could rule by decree (for the second time! ), or when Bush nationalized the oil industry and followed that up by nationalizing the telecoms and utilities, and then Bush started up a separate army of urban reservists loyal to him, and then Bush took over national elections by appointing his cronies to leadership positions on the electoral council (and Bush has the names of all those who voted against him, just like Chavez! ), and to top it all off Bush exercised more control over our economy by instituting price controls on over 400 different types of necessities. They're exact doppelgangers! Seriously, Bush has appointed cronies, Harriet Miers and that FEMA guy being the most infamous, and Rumsfeld is a crony who stayed on too long. But Bush paid political prices for them, not so with Chavez. Bush hasn't been a very good capitalist either, not with steel tariffs and bloated non-military discretionary spending on his resume. But far as I can tell, Bush hasn't expanded freedoms but he may have curtailed a freedom or two when it comes to detainees. However, there's no comparison to the freedoms taken by Chavez over his term. CB: But far as I can tell, Bush hasn't expanded freedoms but he may have curtailed a freedom or two when it comes to detainees. That's it, CB? "A freedom or two" lost to detainees, and the rest of us are completely in the clear under the Bush administration? Someone else has decided he can tap all our phones, declare us enemy combatants and detain us indefinitely, &c? In case you ever wonder why no one takes you seriously . . . this passage is a good start. In a more charitable light Chavez is trying to do for the people of Venezuela what Franklin Roosevelt did for the American people. Looking at it that way I cannot fault him. The people of Venezuela were truly without hope before he was elected to change things. And if a few snotty noses get tweaked, so what? Unless Chavez decides to host al Qaeda training camps or the like, I can't see the U.S. getting involved militarily. Yee-essss. Remind me - were there any al-Qaeda camps in Iraq? Are there any in Iran? And it's very unfair to compare Bush to Chavez. Chavez took power after a free and fair election which he won. CB: you no longer have the right to a fair and open trial. You no longer have the right to legal representation. You no longer have the right to have your personal communications safe from eavesdropping without the imprimatur of a court. You no longer have the right not to be tortured. By fighting the Reublican party today we are fignting agaisnt a political organization that does not respect or support the principles of democracy . The rhetoric is all about patriotism, but the bahavior annd policies are straight out of Sinclair Lewis. As much as I dislike Bush, comparing him with Chavez is pretty silly. As Charles points out, Bush is paying a pretty hefty price for his missteps. The Republicans are paying a hefty price for supporting him. Bush has enacted some undemocratic policies but luckily we have robust mechanisms to correct what is either grossly unconstitutional or distasteful to the majority. Chavez can simply change the rules to suit him if it gets too hot in the kitchen. I'll probably regret saying this, but some of the comments in this thread are why it's hard to take (some) liberals very seriously. I despise Bush and think his neocon/theocon buddies have been a disaster for this country, but how about a little perspective? Bush hasn't even curtailed civil liberties as much as liberal heroes FDR and Woodrow Wilson, much less Hugo Chavez. FWIW, I think our best course with a guy like Chavez is to ignore him. Like all Latin American caudillos, he'll eventually get overthrown or just grow old and die. Venezuela will outlast him, and so will we. But Charles has put together an informative and chilling post about this Champion of the People, and all some of you want to do is drag in Dubya. On preview, cleet said it better and nicer than me. And, that was supposed to be "heet." Sorry. CB, other than a couple of your normal phrases, I have to say this is the one post you have written that I really appreciated reading. I think there is a tendency on part of the left to automatically disregard the flaws of those who are perceived as standing up to Bush. This strips away the veneer, and I appreciate your efforts. Chavez is no hero of mine, although I tended to be among those who pointed out that he is democratically elected, etc. I think he may well be one of those people who started out with an honest effort to help the poor of his country, but whose own sense of power pushed him in another direction. He perceives himself, IMO, as a savior of his people, and whenever anyone gets a form of messianic complex there is trouble. Actually, for those who want to see a comparison of Chavez and Bush, I think this is probably the most apt. I think Bush has also seen himself in the messianic light, although his primary pushers (Cheney et al) I think see him as a useful tool. I do think some of your commenst in the thread have underpalyed some of what has happened under Bush, but you are correct that there is a lot of difference betwen the two. I think this has more to do with the nature of this country as opposed to Venezuala, however, and not necessarily a difference between the two persons. Bush wasn't nearly overthrown by a coup supported by wealthy Democratic elites with the cheering of the opposition press. If ever that happened we'll see how many freedoms are left afterwards. It is silly to compare Bush and Chavez because the circumstances are very different. Bush is in a country with a centuries long history of largely successful struggle for democratic rights and liberties. Personally I don't doubt for a second he'd be a tinpot dictator if he were in Venezuela, or he'd have been one of the sponsors of the attempted coup and if it had succeeded, I suspect that some Chavez supporters would have faced rather unpleasant circumstances if Bush were the new leader. Or bring Chavez here. He'd find no more scope for his authoritarian tendencies than Bush has had. Maybe he'd fantasize about being a dictator while gloating over the people he has executed as governor, or maybe he'd feel all manly over his determination to strip prisoners of basic human rights. I wouldn't compare Chavez to FDR. I'd compare him to Huey Long. I don't blame the Venezuelan poor--there are obviously reasons why they identify with Hugo Chavez, just as there were reasons Long was popular with poor people in Louisiana. Bush wasn't nearly overthrown by a coup supported by wealthy Democratic elites with the cheering of the opposition press. To be honest, I get the sense that they felt exactly that way about the 2004 election. One thing about Bush, unlike any other President in my memory, is his ridiculously undeserved sense of entitlement with regard to the Presidency. I don't know how the Bushies felt about the 2004 election, but I suspect that even they can distinguish between a peaceful electoral process and an illegal coup. Put them in exactly the same position that Chavez is in and they'd act the same or worse, I think. I don't think the reason we avoid death squads and torture--well, death squads anyway--in the US isn't because our politicians all lack authoritarian impulses. The difference is in the surrounding circumstances. "A freedom or two" lost to detainees, and the rest of us are completely in the clear under the Bush administration? Someone else has decided he can tap all our phones, declare us enemy combatants and detain us indefinitely, &c? First, what 3GB said. Look at the practical effects, dr. If you're a U.S. citizen with known ties to al Qaeda and actively plotting a terrorist attack, then you may get classified as an enemy combatant and be detained, all the while having your case heard before the courts for years. If you're on the phone with a fella in Waziristan who is a known al Qaeda suspect, then the NSA might just listen in. If you're suspected to be actively affiliated with al Qaeda, then a FISA court judge may well authorize the federal government to secretly examine your records. Do you really think that is at all comparable to the wholesale freedoms and expropriations taken by Chavez? The real problem with Venezuela is institutional. They didn't have a strong enough constitution or a strong enough system of checks and balances, and they didn't have a cohesive enough opposition party. This opened the door to an authoritarian-minded communist in the person of Chavez to take advantage of this weak system and overweight the balance of power to his own self. Another Venezuelan president with far fewer ambitions wouldn't have taken that path, but Chavez did, levering himself at every opportunity to amass power to himself. Remind me - were there any al-Qaeda camps in Iraq? Are there any in Iran? No, and I don't know, ajay, but when did Chavez invade a neighboring oil-producing nation, gas his own people, start a nuclear weapon program, and then violate a succession of binding UNSC resolutions? Kind of a different situation. Thanks for stopping in. I forgot about the EU being stonewalled in the last go-round. CB, while I agree with you that Bush is hardly capable to Chavez, please don't fall into the trap of acting like you've been secretly briefed on the scope of the NSA's surveillance activities. And I'm shocked that any honest conservative can just shrug off the Padilla case. "He was actively plotting a terrorist attack... at least, the government told me so at a press conference!" CB thanks for the post. Good stuff. I appreciate the research and bringing together of a whole series of issues in one place. I don't keep up with Venezuelan politics at all, and this post helped me. Re: the various responses: I think the hypocrisy cuts both ways. Republican hypocrisy: If you're against Chavez's power grab, you should be against Bush's. Doesn't matter that Bush's is less severe, the principle is the same. If what Chavez did was wrong, then what Bush did was wrong. Why minimize the one and trumpet the other? Democratic hypocrisy: If you're against Bush's power grab, then you should be against Chavez's. Doesn't matter that Chavez was democratically elected, the principle is the same. If what Bush did was wrong, then Chavez is also wrong. Why minimize the one and trumpet the other? Is it really more important to try to "score points against the other team" than to judge political events and people based on principles? but when did Chavez invade a neighboring oil-producing nation, gas his own people, start a nuclear weapon program, and then violate a succession of binding UNSC resolutions? Kind of a different situation. Irrelevant. You said: "Unless Chavez decides to host al Qaeda training camps or the like, I can't see the U.S. getting involved militarily" and I pointed out that the last country the US attacked didn't have any AQ training camps, and the country the US looks most likely to attack next doesn't have any either. Look at the practical effects, dr. Yes, let's look at the practical effects. You could start by reading all the posts on this blog under the category "Maher Arar". Argh. What was done to Maher Arar, Jose Padilla, and others was unconscionable, but Charles's post includes an account of MASS MURDER of miners by Hugo Chavez's troops. This whole Bush/Chavez comparison issue is irrelevant for any practical purpose, especially the hypotheticals about what if Bush was president of Venezuela etc. They're both bad; they should both be opposed; quibbling about who's worse is like debating which superhero could defeat which other superhero. Also, ThirdGorchBro: I love the name. but Charles's post includes an account of MASS MURDER of miners by Hugo Chavez's troops. According to one witness, in a story behind a subscription wall. Note, "Hugo Chavez's troops" can also be called "Venezualan troops", belonging to a military that tried to overthrow Hugo Chavez in 2002. Also, continuing buses by Venezualan soldiers and police predate Chavez by decades. In other words, there might be more to this story. Note, I could phrase what happened in Haditha as "U.S. troops committed MASS MURDERS of Iraqi families!" That should be "continuing abuses"
Human Rights Watch and Amnesty International have Venezuala sections that are worth reading. You could truthfully say that the evidence isn't clear; you could reasonably say that you thought the preponderance of the evidence was against it. You could even claim that what evidence exists is of doubtful probity- but to baldly claim that no evidence exists is either lying or damn close. See this, for example. Unfortunately, quite a bit of the work I find is in Spanish (eg here). Unfortunately for me, anyway. It's also worth noting that the US was funding the anti-Chavez labor group whose march triggered the coup, as well as other anti-Chavez groups in Venezuela. These groups met more frequently with the US delegation in Venezuela than the Venezuelan government did, and frequently discussed a coup. The US report on the subject makes it clear that US disavowals of a coup were often formulaic and didn't prevent further communication with and support of these individuals/groups. [I mean, when someone tells">http://oig.state.gov/documents/organization/13682.pdf">tells you "I'm not asking for permission. I'm just telling you what will happen" before the coup & you keep giving him money- well, you get what you pay for]. I wonder how you would react to a foreign government frequently meeting with and funding groups that attemped a coup of the US government, praising the coup-plotters and speaking of the coup as a fait accompli, only condemning it after it had sputtered. I don't think you'd need to see a memo from that government saying "overthrow the US government" in order to deduce hostile intent. Nor do I think you would hesitate to excuse all manner of extreme extra-constitutional measures in order to restore and maintain the legitimately-elected government. (And pile upon that the history of the US in Latin America; when you sponsor coup after coup, sooner or later you can expect to be suspected of involvement in a coup when you've spent the prior year funding and having talks with the coup perps). 1)the violence was all coming from Chavez and his supporters (in fact, the clashes on April 11 resulted from an anti-Chavez protest march departing from their planned route and diverted into a pro-Chavez rally). Each side claimed that the other initiated the violence, but there is no clear evidence one way or the other. Reeker went so far as to claim that the pro-Chavez forces were acting "on orders", firing on "unarmed, peaceful protesters", and that Chavez had committed "human rights violations". None of this is substantiated. 2)That the anti-Chavez media performed a public service (Fleisher: the media valiantly kept the Venezuelan public informed), when they were in fact effectively broadcasting inflammatory propaganda (eg showing footage of pro-Chavez marchers firing off-camera and claiming that they were firing on unarmed anti-Chavez marchers; later this was debunked). Anti-Chavez media also refused to show the pro-Chavez rallies that led to the end of the coup, departing from their earlier insistence in showing (anti-Chavez) events as they unfolded. 3)That Chavez resigned (whether this occurred is unclear), without mentioning the whole gun-to-the-head, surrounded-by-rebel-tanks part of the equation. 4)The coup forces were the forces of 'democracy', while Chavez committed "undemocratic actions"
Unless we're going to get into one of those debates where you're technically correct because George Bush never said "I endorse the coup" (a la the "imminent threat" debate), these statements are both supportive of the anti-Chavez forces and relay a completely one-sided version of events. Furthermore, they accept the coup as an accomplished fact and emphasize how Venezuela must move forward with it's new transitional government. If that's not an endorsement, I don't know what you're looking for. Our rhetoric has paled before Chavez's. That is profoundly irrelevant to any point anyone has made. Why must you constantly compare our behavior to bad people and noting that we've passed the lowest bar possible? Do you think so little of America? Putting aside your past attempt at questioning my patriotism and your present attempts to impugn my integrity and to pretty much call me a liar, there are a few points that should be answered. First, your link to the Guardian (with a Los Angeles byline) is an example of the problem. Their primary source is a former NSA/Navy guy who's been out of government service since 1994 (best as I can tell), who has a political manifesto to the left of the Guardian, who even SourceWatch calls "muckraking", and who has a history of making highly questionable claims. Excactly what (or who) were Madsen's sources? Neither Madsen nor the Guardian say. But the more important question is why the Guardian would believe this man to be credible in the first place. Their other primary source, Roger Rondon, was a National Assembly chavista who later fell out of favor (cite), and his claims fall under the category of "he said, she said". Rondon accuses, America denies, and there are no additional facts evidence to justify the claims, so it ends there. The Guardian piece is classic biased journalism, long on allegations from dubious or extremely biased sources, and short on actual evidence. As for Eva Golinger, she is an unswerving chavista who has been paid by the Chavez government for her legal services, and is a regular contributor to the pro-Chavez mouthpiece venezuelanalysis.com. There's nothing wrong with that, but it helps to know where she's coming from. Her allegations (that the "CIA was involved in the coup") doesn't square with the documents. In fact, in the 4-6-2002 transmittal, the CIA assessment of a successful coup was pessimistic in part because of "...repeated warnings that the U.S. will not support any extraconstitutional moves to oust Chavez probably have given pause to the plotters." Knowledge doesn't to equate to involvement, and the warnings are the exact opposite of an endorsement for a coup d'etat. The OIG report confirmed it as well (thanks for the link BTW). Their conclusion is that there is no evidence that the U.S. was involved in the weekend coup or that the U.S. endorsed it. The report was ordered by Senate Democrats, so you can't claim that this was some sort of whitewash. Or was the OIG "lying or damn close"? As for NED and USAID, they send money to groups that are pro-democracy and pro-democratic reform. Given that Chavez has consistently tried to thwart pro-democracy proposals and reforms that liberate, no wonder he and his allies are so incensed about it. Whether that is "heavy-handed" is a matter of opinion, but if so, then we're heavy-handed with the majority of countries on the planet including most of Latin America. That is profoundly irrelevant to any point anyone has made. No, it isn't. You claimed heavy-handedness and our own rhetoric is part of that equation. I'll get into Fleisher and other official statements later. Or not. This is the second time I've written this comment because my first attempt disappeared, and I've already spent enough time. It never ceases to amaze me how autocratic types on either side of the aisle resemble each other so closely while hating each other so much. If you're calling me an "autocratic type" and a hater, then you're violating the posting rules, particularly since I've been advocating for more freedom across the world, not less. I'm a bit confused by the concern about Chavez' human rights record. I'm all in favor of a policy that places human rights at the top of any list of considerations, but we are currently closely allied with some of the most anti-democratic, anti-human rights, anti-freedom governments in the world (Saudi, anyone?). We do this because as a nation we are moral cowards when the penalty for right action is financial hardship. Also, since anti-americanism is a core element of Chavez' schtick, any attacks on him from the US only make him stronger. If the US was to pursue an approach of indifference towards Chavez personally, coupled with straightforward diplomatic engagement, He'd lose his punching bag and have to justify his government's action based on other factors. Having the US all but endorse a violent overthrow of an elected leader is not just rank hypocrisy, it's also bad policy. from what i can tell, Chavez calls himself a Socialist, not a Communist. this is the only source i have seen that claims that he's a communist. Or 'better' still, "George Bush's troops committed MASS MURDERS of Iraqi families!" is Chavez acting like a dictator, or reacting to the consistent efforts of the Bush administration to destabilize Venezuela and destroy Chavez? pl, I'd not defend Chavez on that score. I think that it's possible to criticize US foreign policy decisions without implicitly praising autocrats (and vice-versa). I wouldn't fault some of his decisions during the coup (eg shutting down the TV stations that were basically acting as agents of the coup), but that doesn't meant that Chavez's actions are either reasonable or entirely defensive. It's funny that, in Charles's great list of transgressions, the only ones I can see as truly problematic are the consolidation of power (surely he could find other non-coup-supporting allies to work with) and the military violence (but, as pointed out above, Im not sure that this can be laid at his doorstep). Yes, Chavez is doing socialist things such as nationalizing industries, but presumably that's stuff the people knew was going to happen when they elected a Socialist. It doesn't make Chavez a bad man, or an autocrat. But they aren't so profoundly different on their face. I feel comfortable defending Chavez on both counts (nb of course, that doesn't excuse his other autocratic tendencies) bc things were genuinely worse in 1989-1992, but I can't see how someone could hold the opposite position (ie that the 1992 coup attempt is a stain on Chavez's record, but the 2002 coup was justified)- unless they hold a results-based view of justification (eg the contrived logic of Jeane Kirkpatrick). If you're a U.S. citizen with known ties to al Qaeda and actively plotting a terrorist attack, then you may get classified as an enemy combatant and be detained, all the while having your case heard before the courts for years. If you're on the phone with a fella in Waziristan who is a known al Qaeda suspect, then the NSA might just listen in. If you're suspected to be actively affiliated with al Qaeda, then a FISA court judge may well authorize the federal government to secretly examine your records. It's like you don't know what "freedoms" are. Freedoms are not things that are granted to you by the government if they feel like it. Freedoms are things that we guard very carefully, only permitting them to be infringed upon via open judicial processes, and even then we tend to bend over backwards to safeguard them. (It's also like you've never read any of the voluminous writing of the Founding Fathers warning against excessive and arbitrary government power). I can imagine that there is a Chavez supporter saying similar things: you only have to worry about expropriation if you exploit the poor, you only have to worry about suppression of speech if you undermine the government and work with enemies of the state, etc. What sort of government do you support then, Charles Bird? Or are you the type that goes down a liberal checklist for every leader that calls himself a socialist, and shakes his head tiredly when all the boxes are not checked? Chavez has been spending a great deal of time combatting a powerful opposition. The food shortages, some claim, are being caused by opponents of Chavez. He's trying to fight to hold power against sustained attack from the US, and he's succeeding. It's not pretty, and many supporters of Chavez around the world are critical of him without trying to pigeonhole him. Isn't critical support of an attempt like Chavez' more productive? Or are you one of those people that hugs his purism to himself, limiting himself to local political expression? Social change isn't always pretty. What sort of government do you support then, Charles Bird? Simple, Esther. If it's already free, I support a government that will protect its citizens' freedoms. If the country is unfree or partially free, I support a government that will give its citizens more political and economic freedoms. I agree that social change may not be pretty, but at least it should be done in a matter that respects the rights of the people. If you support basic principles of freedom such as the Universal Declaration of Human Rights, I don't see how you can defend a fella like Chavez. But it sounds to me you've already bought his propaganda and your mind's made up. Chavez being elected illustrates an important point that people fail to understand. A majority does not have the right to vote away the rights of a minority. There is s concept called individual rights. They are inalienable, and cannot be taken or transfered away, no matter how many ignorant peasants vote for it. That is what separates a republic and a democracy. Your rights are protected. Karl Disher: There is s concept called individual rights. They are inalienable, and cannot be taken or transfered away, no matter how many ignorant peasants vote for it. So as in the US people's rights are not protected, because of a President a minority of people voted for, the US is neither a republic nor a democracy? I think a point has been missed above, and it relates to the extractive resource curse: It's unlikely that Chavez is unaware of the damage his actions are going to do to his country's economy. His power center is the oil industry, feeding the government's economic dominance over the private sector, and the more he beats down the private sector economy, the more secure his position is. He wants to destroy everything but the oil industry. And, yes, it's true that the country will survive Chavez; The landmass isn't going to evaporate on his demise, after all. But when that oil runs out, they're going to be a very, very poor country, with deliberately destroyed civic institutions. Their prospects will be bleak. 64% of people electing their leader? yeah, that sounds like dictatorship to me. Venezuala - the highest spending on arms in Latin America? Why not re-calculate that over all the Americas and see how the numbers come up? 10-12% of your oil is purchased from this country? Aaah I see... could this possibly be why the US feels a bit uncomfortable with Chavez? You totally missed the point. Whether Bush was electd by a minority or majority is irrelevant. In neither case does it give him the right to take away your right to live. I don't care if Chavez was elected by 60 percent of the populace. It doesn't give him a mandate to steal property from the minority, which in this case is the rich or those who own property. By your logic, there should have been a vote on whether slavery was to be allowed. If greater than 50 percent of the population votes for slavery, then too bad so sad. I'm sure if you took a vote in 1860 in the south, blacks would have lost out. Correct? Morality is independent of how many people believe in it at the moment. That is why we have a constitution in the US which is above the whims of the ignorant masses. The founding fathers saw the danger and organized our government in a way designed to protect minorities.